As new technology is constantly brought onto the market, it stands to reason that sometimes you will get products which clash. Sometimes, these two variants on the same product can co-exist quite happily, but other times a vicious battle of merchandise ensues and one product will knock the other off the market! This was the case with the fight between Blu-Ray and HD DVD, and the war goes back further than you’d think: All the way back to the year 2000! During this time, new blue lasers were being experimented with in optical disc systems. Companies found that by using these blue lasers, rather than the previous red ones, more information could be stored on a disc in less space. This is because the wavelength of a blue laser is smaller than a red one, therefore less space is needed to store the same piece of information. But why were they experimenting with this new technology? What was wrong with the good old DVD? Well, as is often the case, advances in other areas were forcing disc technology forwards: High definition televisions and television services had come onto the market and the disc industry did not want to be left behind. They, too, wanted to provide high-definition products but found that there was simply not enough room on an ordinary DVD. Thus, new technology had to be found to cater for the changes in the market. But here’s the catch: More than one company was making the same discoveries at the same time! The result: Two competing products were brought onto the market and began a battle that would last for almost a decade. Sony and Pioneer seem to have been the main instigators of research, unveiling the DVR Blue at Japan’s Ceatec show on October 5th 2000. It was this disc which would form the basis for Blu-ray, which was proposed some two years later, on February 19th 2002. The plans for the disc were put forward by nine very successful electronics companies, headed by Sony. However, only a few months later, NEC and Toshiba put forward plans for a competing product, the high-definition disc which was to become HD DVD. That year, at the 2002 Ceatec show in Japan, both discs were unveiled. The Blu-ray was shown by Sony, Sharp, Panasonic, JVC and Pioneer whilst the HD DVD, at this time called the Advanced Optical Disc (AOD), was shown by Toshiba. I can almost imagines the competitors scowling at each other across the room: This meant merchandise war! At first, things were slow. New technology is very expensive and the licensing for Blu-ray was extortionate (and necessarily so considering all the money that had been sunk into the disc’s invention!) 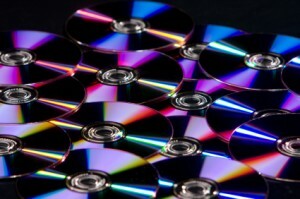 Perhaps due to this, or perhaps simply in a clever marketing move, Sony created a disc which would allow data storage, not only in terms of film, but in terms of business: Companies could now store documents, presentations – whatever they wanted – on these discs, like memory-massive versions of the CD. The technology to be able to write information on discs at home and in the workplace was then used to create the first home BD recorder. It was based upon the BD-RE disc and cost almost $4000! It was a mistake, however, as the machine did not support pre-recorded films and simply served as an extra expense for the companies involved. Despite this mistake, the BD was obviously making headway, however, as Mitsubishi joined the group in May of that year. But what of the HD DVD during this time? Well, truth be told very little happened with the HD DVD of note until early 2004, when Toshiba unveiled the first prototype HD DVD player. The player was well though out as it was backwards compatible with DVD, a customer pleasing feature which brought it attention. However the success was not to last, as only five days later, on january 12th, Dell and Hewlett-Packard, major electronics companies, made public their decision to back the Blu-ray disc. Then, on September 21st, Sony announced that their PlayStation 3 would support Blu-ray discs. This was a canny business move on Sony’s part, as they knew that many of the people who play PlayStation games are also a major section of the film-buying market. Therefore, by cornering the gamers into watching Blu-rays simply because they already had the player, they sectured an enormous amount of business in one fell swoop. But in late November, several world-famous film studios came together to give their support for the HD DVD. This was a massive boon for the HD DVD; getting the backing of Warner Bros. Pictures, New Line Cinema, HBO, Universal Pictures AND Paramount Pictures secured for them a massive portion of the film-making industry. However, they had missed off one of the most influential giants of movie-making: Disney. And ten days later, this titan of business gave its support, not to the HD DVD, but to Blu-ray. In mid-2005, Sony’s president made a show of wishing to compromise or integrate with HD DVD, knowing as he did that consumers were becoming tired of having choose between the two rival formats. But still the war dragged on, though talks were indulged in for several months between Toshiba and Sony. Companies kept siding with one of the other format until, late in 2005, Paramount Home Entertainment decided to offer their films on both HD DVD and Blu-ray. Some other companies followed suit but there was still an air of stagnation and irritation on the market. So we come to March 2006, when Toshiba put their new HD DVD player on the market. It had been in development for some moths by LG Electronics, no doubt also backed in part by Microsoft, who had decided to rival the PLayStation 3 and provide an HD DVD drive add-on for their Xbox 360. The disc player was much more of a success than the initial Blu-ray model, as it was cheaper (by about $2000!) and also played all pre-recorded data. 2007 saw the HD DVD take over the market, stealing support from companies who had previously backed Blu-ray as their HD DVD-player sales rocketed to 100,000 in north America alone. This was despite the fact that LG had put together a dual-format player and Warner Bros. had developed a disc which had two layers: One HD DVD and the other Blu-ray, so that it was compatible with all players. HD DVD player prices dropped dramatically and Sony were forced to follow suit, reducing the price of the PlayStation 3 in early November – just in time for Christmas! So, things were looking up for HD DVD, but Warner Bros. had a bombshell to drop in the new year. On January 4th 2008, the dropped their support of HD DVD and went over to Blu-ray. “All of us at Sony are feeling Blu today!” Said Sony CEO Howard Stringer later that week, smiling broadly. It was a major blow to HD DVD’s confidence and success. Though they cut the prices of HD DVD players, the market was simply not interested anymore and consumers began to side more and more with Blu-ray. Companies NetFlix and BestBuy had said they would phase out HD DVD by June only a month after Warner Bros. announcement and five days later, Toshiba halted the production of their HD DVD players. Blu-ray had won the war, and just when it looked as if they were about to lose! You are currently browsing the Duplication Centre Resource Centre blog archives for October, 2010.